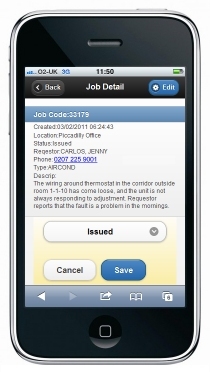 Fast Track Mobile for Smartphone provides remote and on-site access for maintenance engineers and service providers. 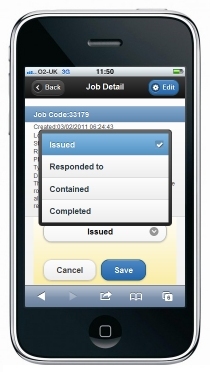 LIVE access gives control of RECEIVING REACTIVE and PPM jobs, UPDATING job statuses, and capturing CUSTOMER SIGNATURES. The technology is designed so that the application works just as well WITHOUT an Internet connection as with: ideal for remote maintenance management work where signals are poor. REAL TIME UPDATES mean savings from a reduced resource requirement for back office staff. COST CONTROL as completion signatures are captured in real time, to aid with invoicing. DEPLOYMENT SAVINGS from little or no outlay on new hardware, and zero training costs. Using the BIG BUTTON approach, engineers can manage jobs in REAL TIME, with no installation on their Smartphones - the software is simply downloaded by users clicking a URL on their Android, iPhone or Blackberry smartphone. Fast Track Mobile for Smartphone fully integrates with the CORE Fast Track Help Desk & PPM components for Windows and Web. Whether jobs are automatically generated by PPM, logged by call centre staff, or by customer self-service, engineers and service providers will be aware of them, wherever they are. Smartphone access can be added for a low per-user cost. To find out more Click Here to Email Us and find out more about Fast Track Mobile for Smartphone solutions. 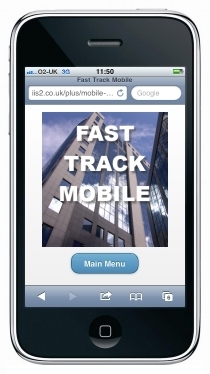 How does Fast Track Mobile for Smartphone work? The following section illustrates the streamlined operation of Fast Track Mobile for Smartphone, and includes images of the software in operation, using an operational web site. When engineers press the link or type the URL for the mobile application on your website for the first time, the whole application is downloaded (and updated if necessary). The logo page appears, and after a few seconds (or when the user presses the Main Menu button), the simple "Big Button" main menu appears. Most selections can be made with a "one-handed click". 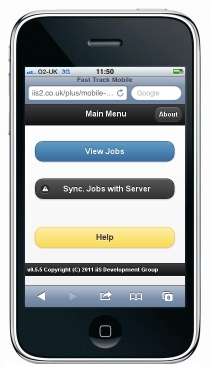 From the Main Menu, users view jobs, and sync with the server, to pass on their updates and receive any new jobs. After jobs are received, the application works perfectly well even if no Internet or WiFi connection is available. This provides for Smartphone Maintenance Management even when underground. When a user presses the View Jobs button, their jobs are shown in a simple, scrollable list. As jobs are updated to Completed, they drop off the list of "work to be done". 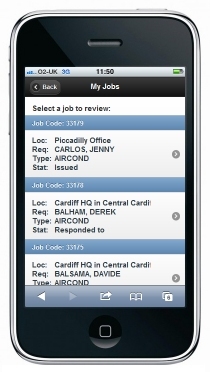 Touching, tapping or clicking on a job takes the user to the detail for the job, which includes the phone number and description. Clicking the description causes the Smartphone to phone the number, after checking with the user that this is OK. When the user clicks the Edit button, the Status Update picker is shown, and the new status can be set by simply picking from the list. Engineers receive the jobs when they are issued, and will typically want to indicate when they have Responded To the job (arrived at site) and Completed the work. Other statuses are available. When the status list appears, users simply touch, tap or click the applicable status, in order to indicate the current, LIVE status of the job. The Contained status indicates a state whereby the engineer has been able to implement a temporary fix to the situation. Upon Completion, the signature capture box appears, and the user can present the Smartphone to the customer for sign off, using either their finger, or a stylus. This function varies by device, and requires a touch-screen. 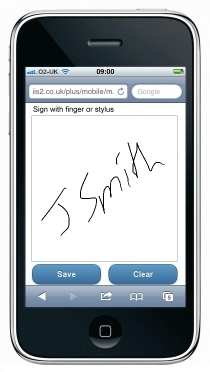 On the iPhone, signatures can be captured by finger, or using an inexpensive capacitive stylus. When Fast Track Mobile for Smartphone users update statuses, the LIVE database is being updated. This means that when Call Centre, Back Office and Customer users review the data, it is live and up-to-date: there is no need for call-ins, after-the-fact updates, or any other second-phase activity. The engineers and service providers are providing the fastest possible update to the main LIVE system, regardless of where they are.